posted by Lisa Ace in Sponsored Post, advertisement, Easter, brunch, fine dining, Reservation, red osier, Stafford. posted by Lisa Ace in Sponsored Post, advertisement, open house, real estate, batavia. posted by Lisa Ace in Sponsored Post, advertisement, Mancuso Realty, Commercial Real estate, Office Space, For Sale, batavia, Tony Mancuso. We need more inventory, with prospects seeking from 5,000 square feet to 150,000 square feet of Warehouse/ Manufacturing space. If you are interested in selling or leasing your property, call Tony Mancuso at Mancuso Commercial Realty and see what we can do for your bottom line. For more than 60 years, Mancuso Commercial Realty has only marketed Industrial and Commercial properties. Call 585-343-5257 today! 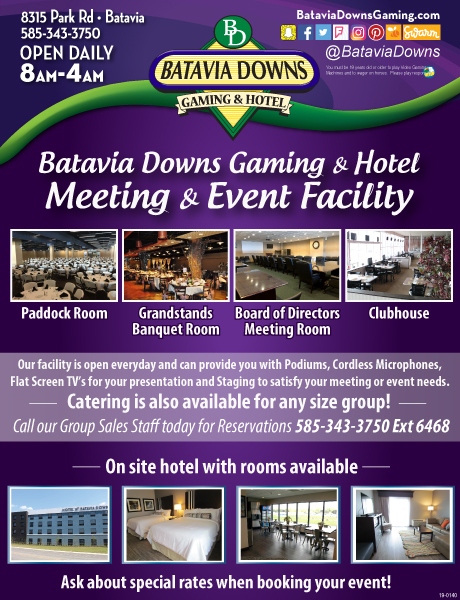 posted by Lisa Ace in Sponsored Post, advertisement, Michael Napoleone Memorial Foundation, derby day gala, Batavia Downs, Fundrasier, Michael's Hope.